Papaya, Carica papaya Linn., is a native to South American and Mexico. From there it spread throughout tropical countries like the Hawaiian islands, Sri Lanka, India and Southeast Asia. 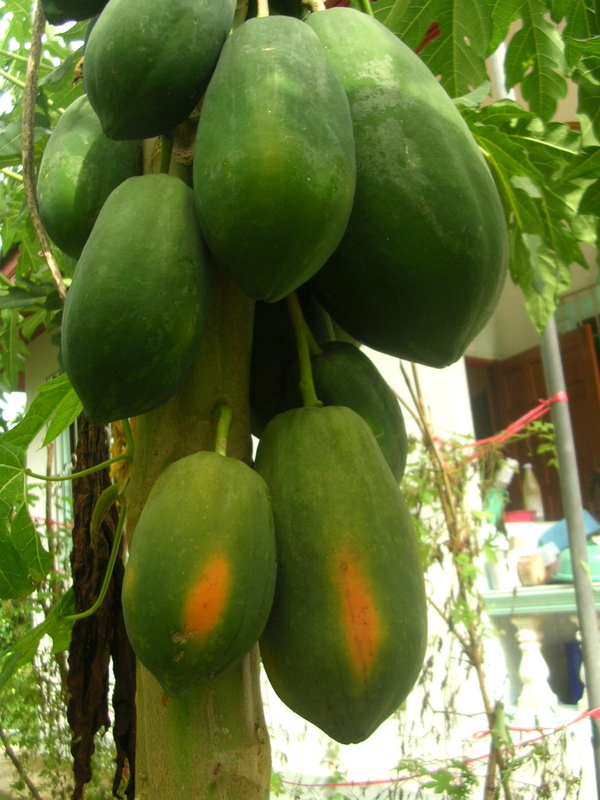 In Thailand, we regard papaya as a herbaceous plant. 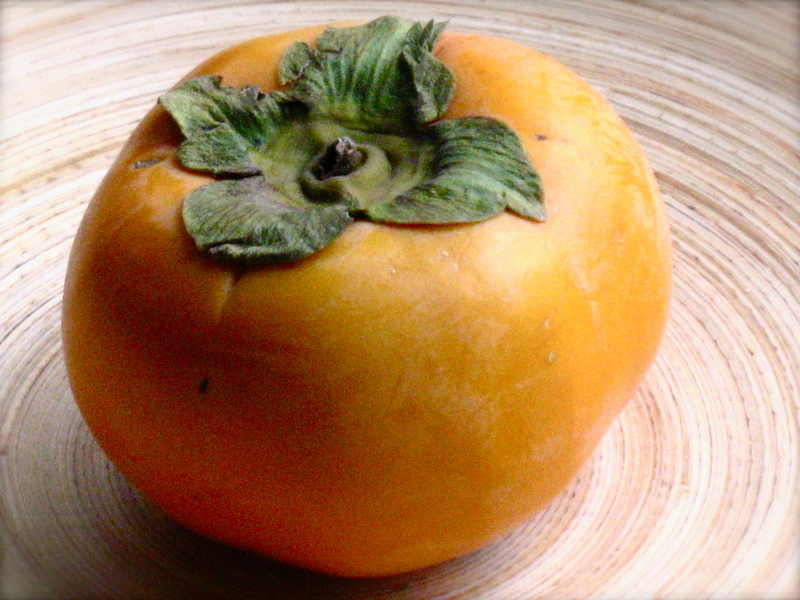 The fruit shape is elongated and has a pointy tip. 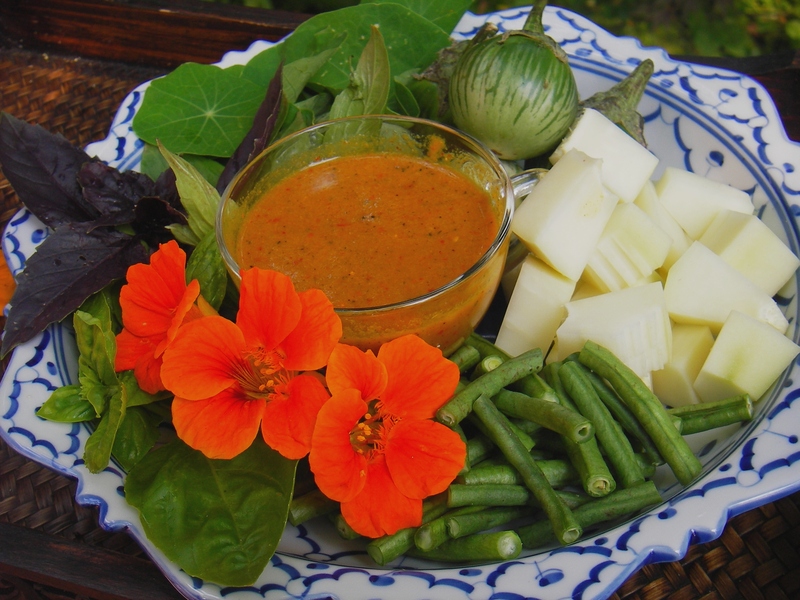 The green fruit is used in savory dishes such as green papaya salad, Gaeng Som (sour curry), Gaeng Kati (red curry), Gaeng Ohm (pork stew), or it is pickled or candied, stir-fried with egg, or used as a vegetable condiment. In our garden, when we want to have a ripe papaya we allow the green papaya to mature on the tree until a good portion of yellow and orange appears on part of its green skin. Then we pick the papayas and keep them covered with a rice sack until they fully ripen. Because the papain protein enzyme helps the digestive system, green papaya salad is an ideal side dish to accompany the grilled meat dishes common to Thai and Vietnamese cuisines—think of green papaya salad instead of coleslaw. 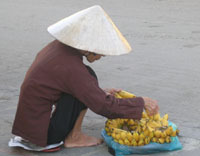 It is best to buy papaya with a great hint of yellow or orange color. 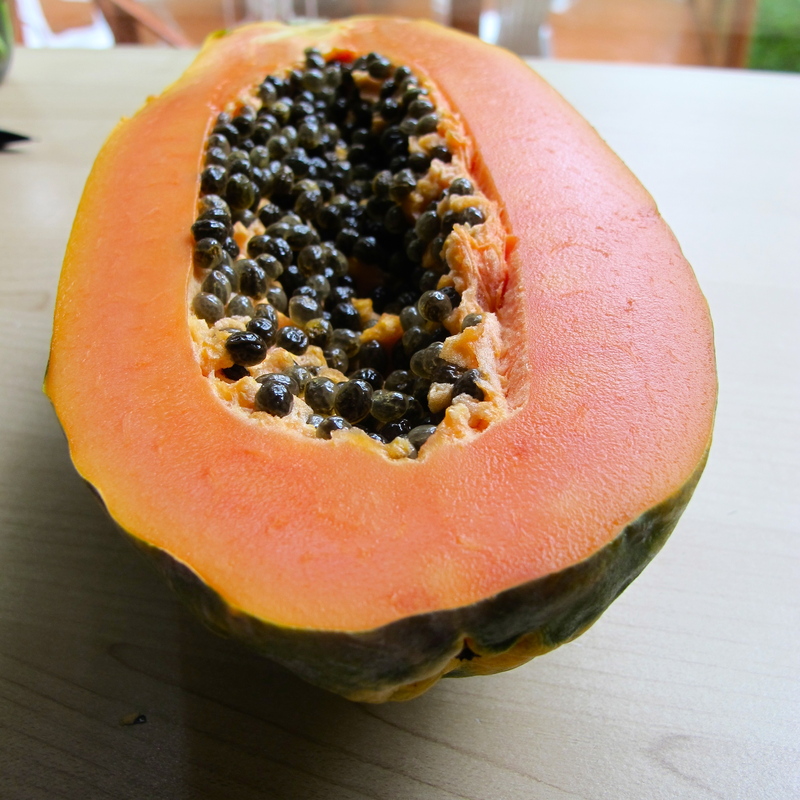 When soft to the touch, peeled and seeded, ripe papaya is great eating fresh or in a smoothie. Papaya is a great source for Vitamin A, C, folate and potassium. For an in-depth nutrient analysis please visit whfoods.com. Thais eat fresh ripe papaya with a squeeze of lime and some sea salt. The seeds have a peppery flavor, but I haven’t come across Thais cooking with the seeds. 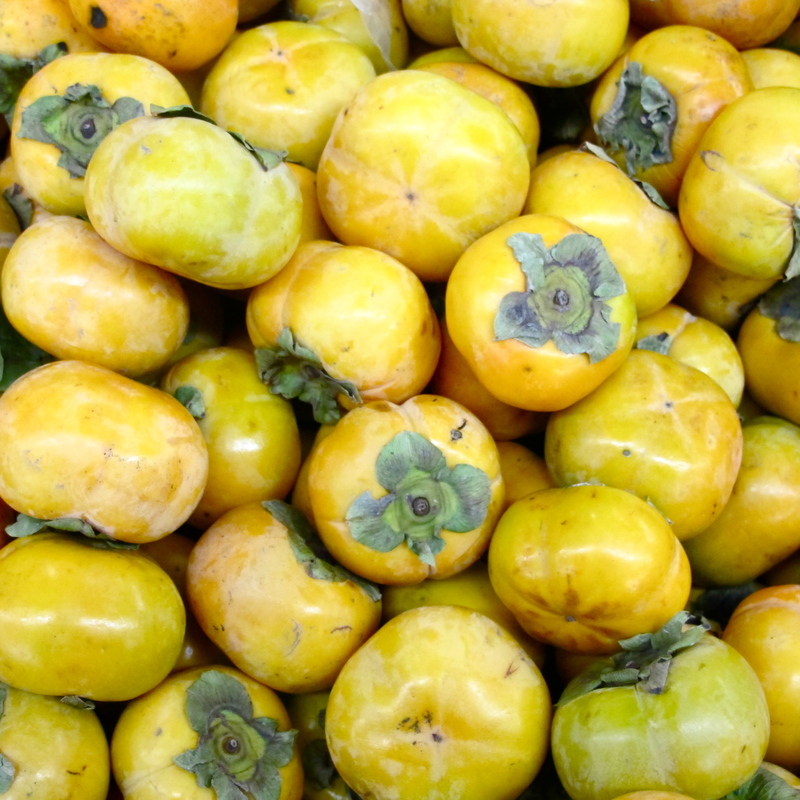 We discard them, but Hawaiian cuisineuses the seeds in salad dressing. 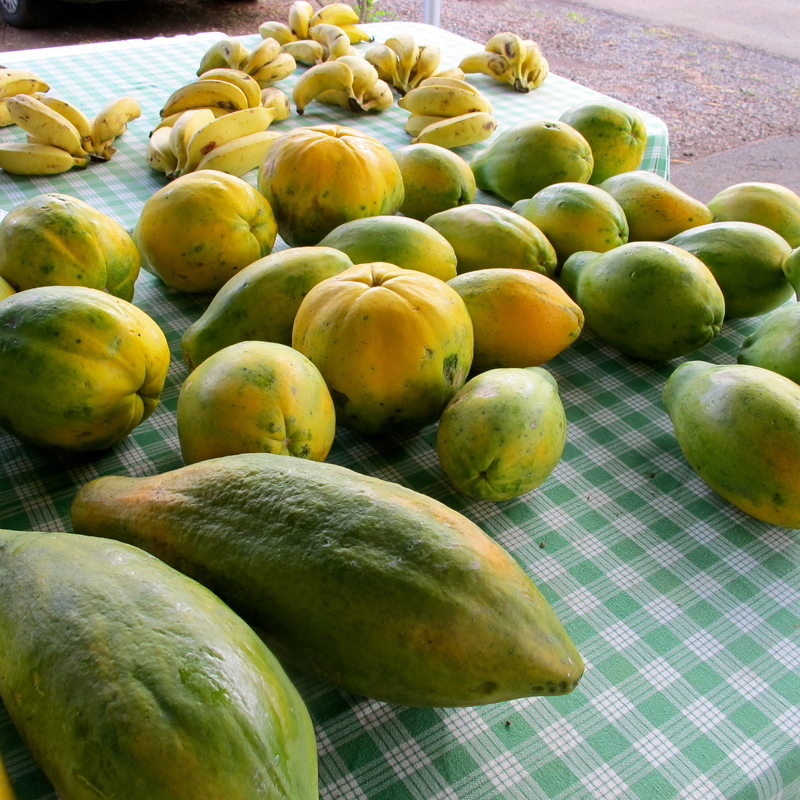 Papayas at the young and green stage are ideal for Thai, Laotian and Vietnamese cuisines. 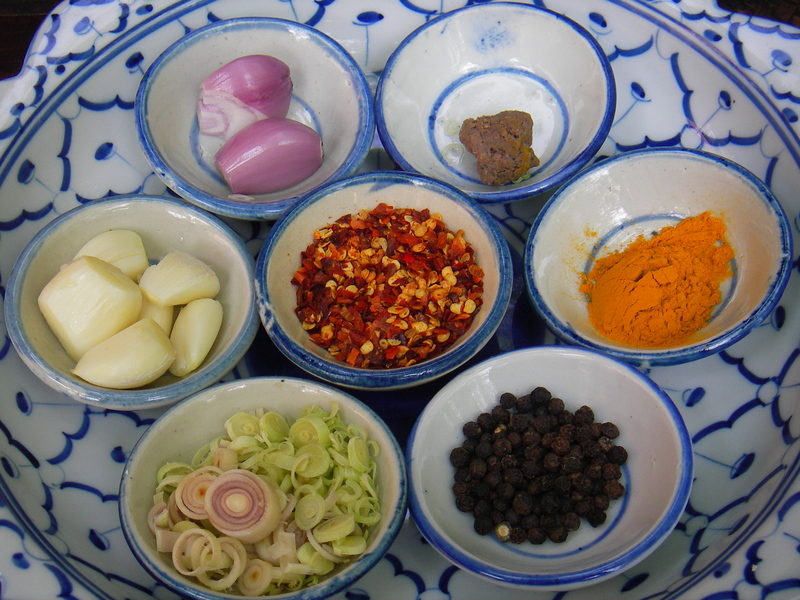 A few examples include the Thai green papaya salad Som tam which also know as Papaya Pok Pok–a fun name that comes from the sound that is made during preparation when the ingredients are pounded with a mortar and pestle. The Vietnamese movie The Scent of Green Papayaoffers an insight into the relationship of green papaya to Vietnamese cuisine and people. I personally have many stories to share about papayas. Place everything except the oil in the food processor. While the processor is running, pour in cooking oil as needed. Blend until smooth. The exotic blend of peppery non-coconut curry with wild vegetables creates the flavor profile inspiration for this dish. I am glad most Thai restaurants carry it on their menus. You may be wary of any spicy Thai curry without coconut milk, but you will be amazed how each vegetable in this curry has it own sweetness when it’s cooked. 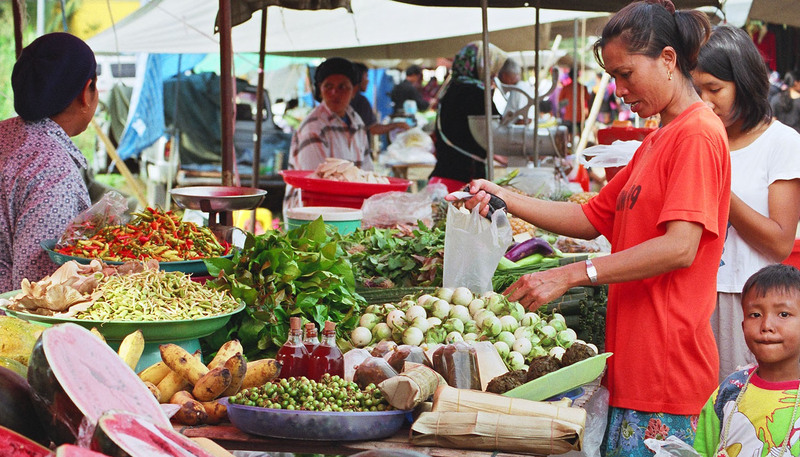 Individual flavors from each vegetable stand out better than in a coconut curry dish. Blend red curry paste and canola oil in a saucepan and cook over medium heat until fragrant, about 3 minutes. Add water and green papaya chunks, stir, then cover with a lid and let it cook for 3 minutes or until green papaya starts to look half-cooked. Add eggplant, yardlong beans and pork and stir, cover and cook for 3 more minutes until eggplant is soft but not mushy. Stir in basil, Kaffir lime leaves, and sugar and cook for 30 seconds more; add fish sauce to taste. Remove from heat and serve with Jasmine rice. Creating a homemade gift is a wonderful way to express your heartfelt thanks and appreciation for your friends, families or associates. Every year I like to come up with something from my kitchen that will interest the recipients and be easy for them to love, such as curry paste, chutney, chili jam or seasoning salt—there are plenty of ideas. 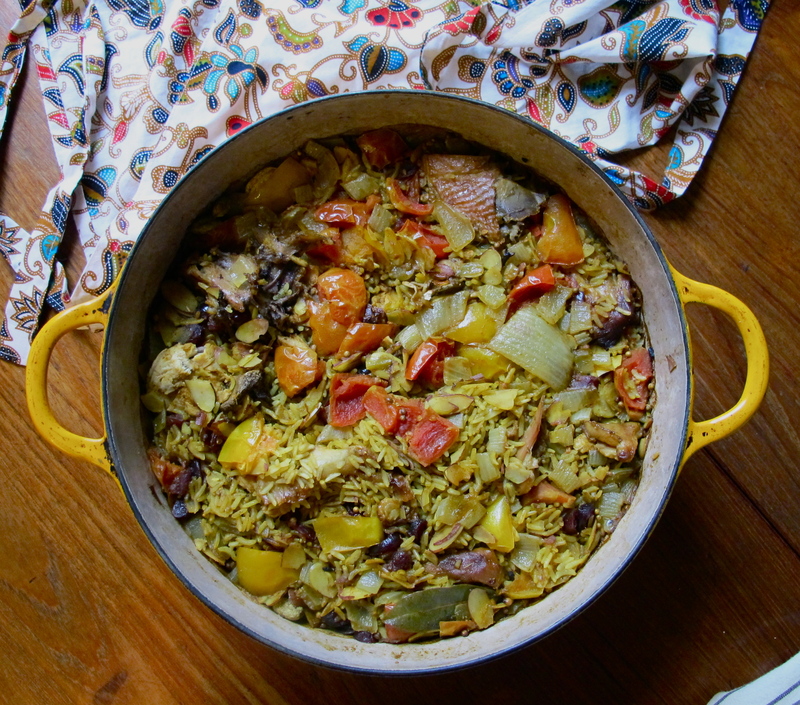 This year it works out well for me to choose an old project—making a rice pilaf mix. This is something that I did with my son’s fourth grade classmates as a parent volunteer project, though this time my rice mix recipe is reconstructed from two favorite Thai rice dishes. You may recognize Thai Yellow Curry Fried Rice with Pineapple (Kao Phad Sapparos) and my favorite Southern dish, Phuket Chicken Baryani Rice (Kao Mok Gai). 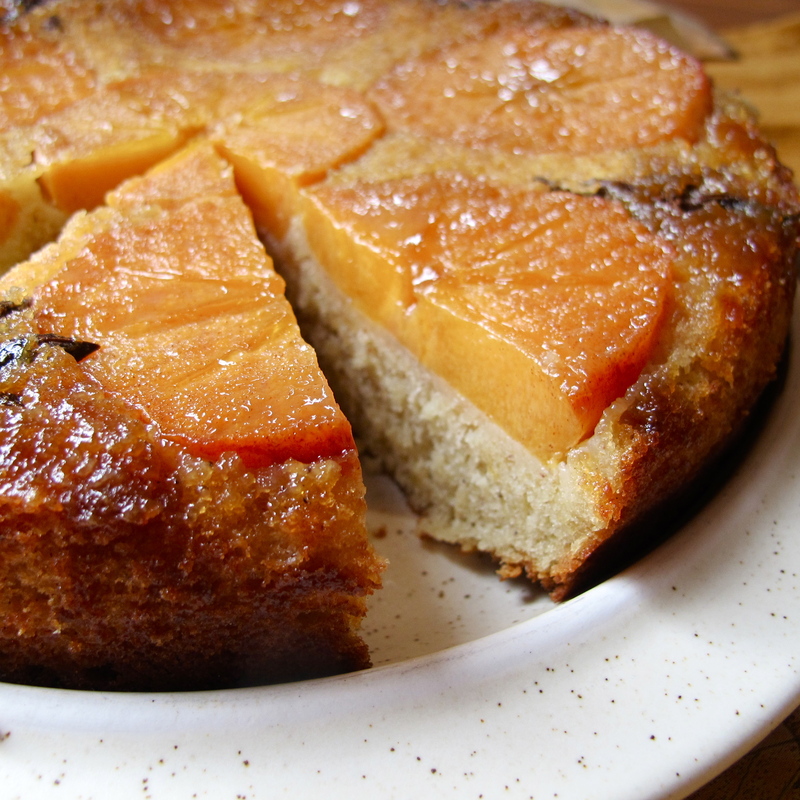 I trust that you will enjoy this versatile recipe often. My plan is to give the rice mix as a gift to friends and family, but it also makes a good side dish combined with leftover turkey. 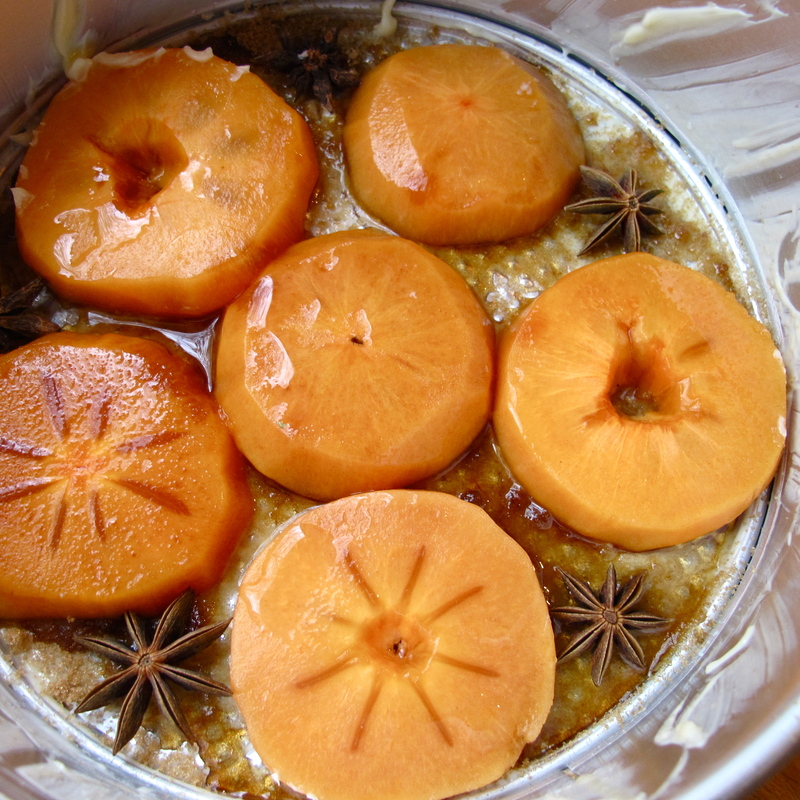 Right after Thanksgiving will be a great time for you to try out the recipe before making up the mix to give as a gift. The rice dish made from the mix can also be called a rice pilaf, a traditional Persian dish, as I applied the science of baking rice in the oven instead of using the traditional Thai method of preparing it in a rice cooker or steamer. The recipe below has so much potential that you can add any vegetable you desire, just like in a rice pilaf. Following an American Holiday theme I use craisins instead of pineapple or raisins, which will be fun cooked with leftover turkey or served as a side dish with turkey. So make it fun and be creative with your own accent. 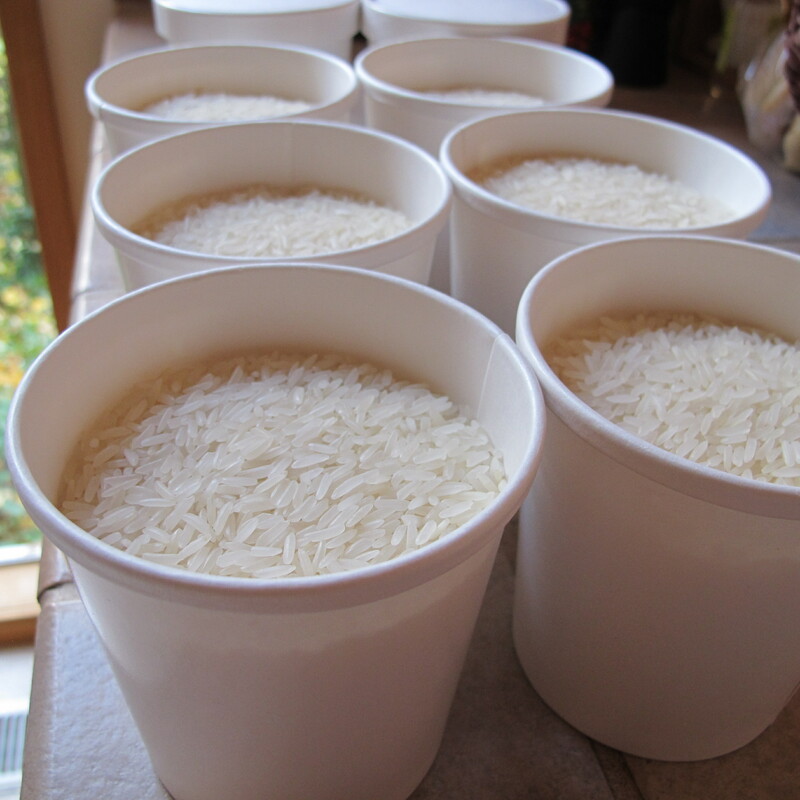 I hope you have a chance to create a rice mix for a friend or simply pack a few boxes to take with you to your cabin. 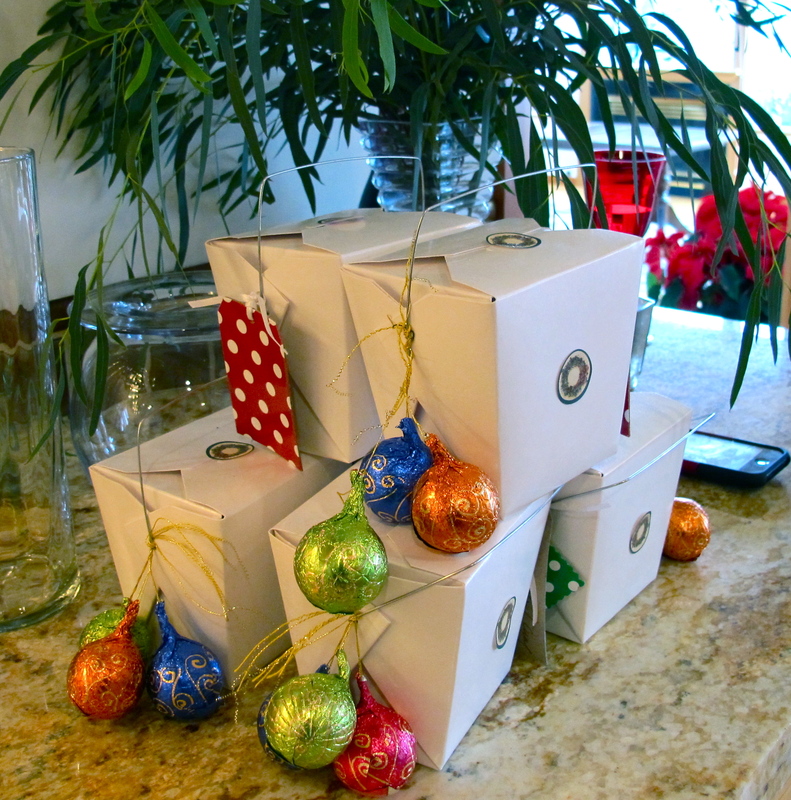 Let’s celebrate with a gift from our kitchens! 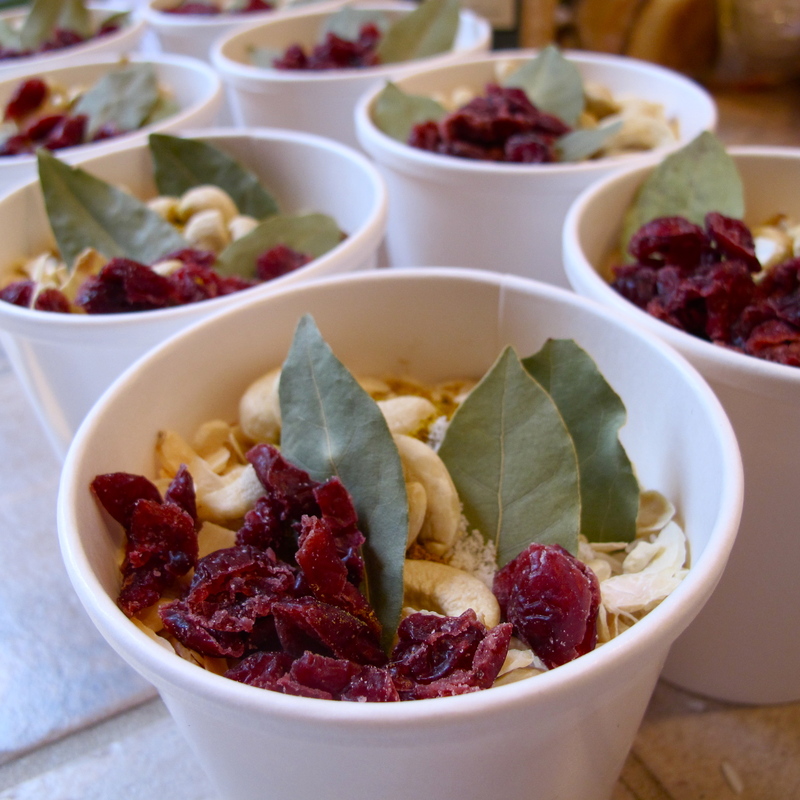 First start with the uncooked rice, then add the spices, dried fruits and nuts. Keep it simple and creative. I purchased large quantities of all of the ingredients below and containers from the packaging specialty store. This recipe makes one gift package which will serve four as a main dish or eight as a side dish. 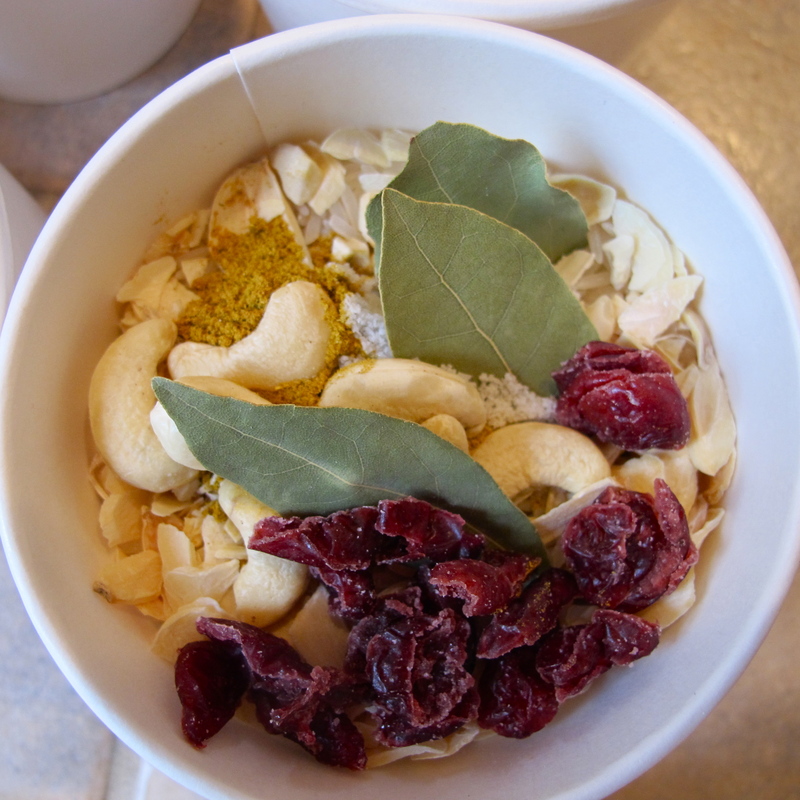 Place all ingredients in the container or ziplock bag in this order: jasmine rice, dried chopped onion, curry powder, cashew nuts, salt and bay leaves. Cover the container or ziplock bag and seal well, then add printing cooking directions (see below). Add some gift wrap or a bow and your gift is ready. Heat a Dutch oven or an oven-proof pan that comes with a tight lid on the stove top over medium-high heat. When the pan is hot, add canola oil and the Thai Yellow Curry Rice Pilaf Mix. Stir the mixture until it becomes fragrant and the rice grains turn opaque, about 30 seconds, being careful not to let it burn. Stir in water or chicken broth. Place chicken or leftover turkey in with the rice and the broth. Bring the mixture to a boil, then cover the pan and place it in the center of the oven. Bake for 30 minutes without opening the lid. Remove from oven and let sit for 15 minutes without opening the lid at all. Then stir it once to mix cooked rice together and put the lid back on. You can keep it warm in the oven at 100°F until it is ready to serve, but not longer than 30 minutes. Serve with accompaniment on the side. Leftover turkey makes an excellent Kao Mok Gai or twice-cooked chicken in rich spices rice pilaf. Seattle is a beautiful city. When we get some of its rare sunshine, the season becomes memorable. 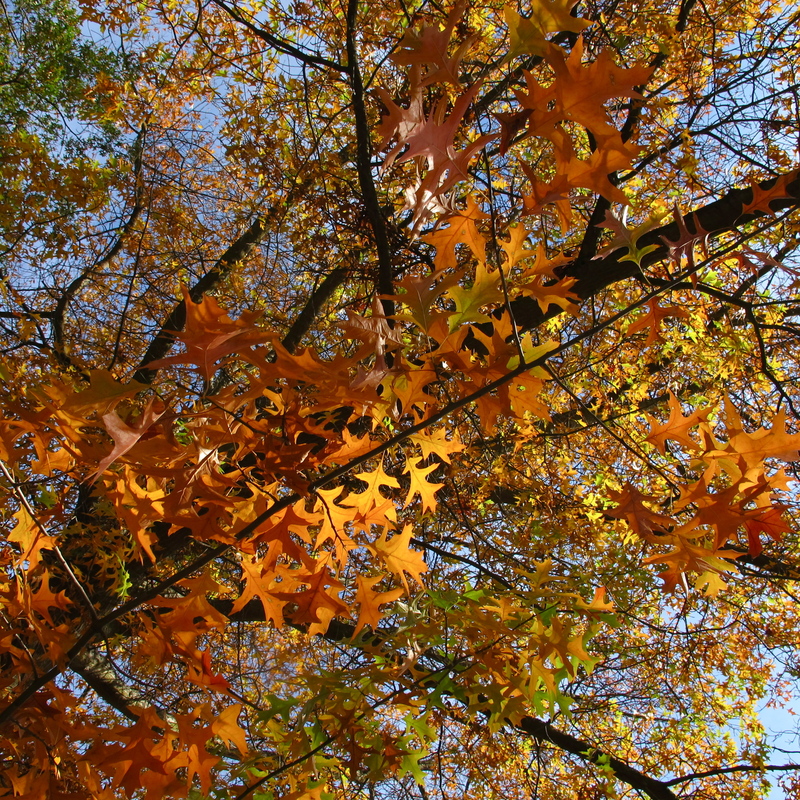 This past week I wished for at least a good week of sunshine and beautiful fall colors and a chance to enjoy the beauty of the Pacific Northwest scenery. I got my wish. 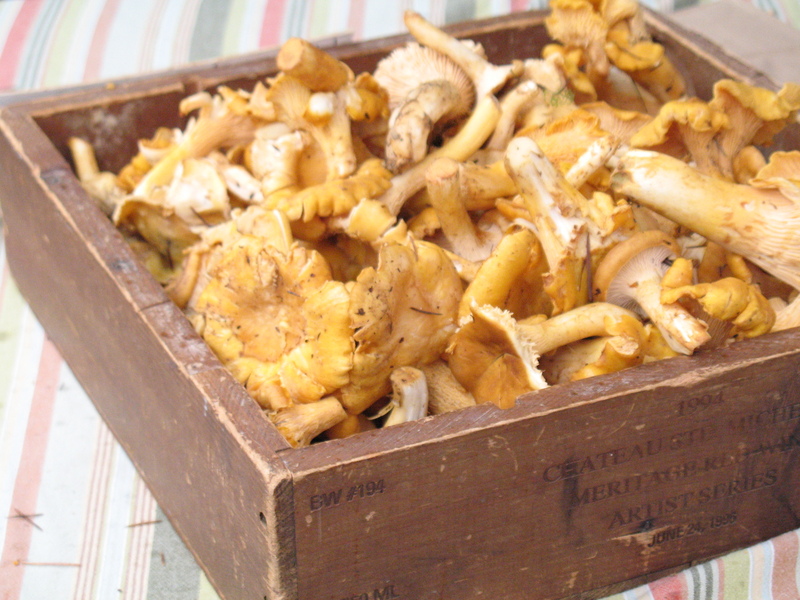 But there is another wish I make each fall as well: I wish for a good price for chanterelle mushrooms. This year I got both my wishes. 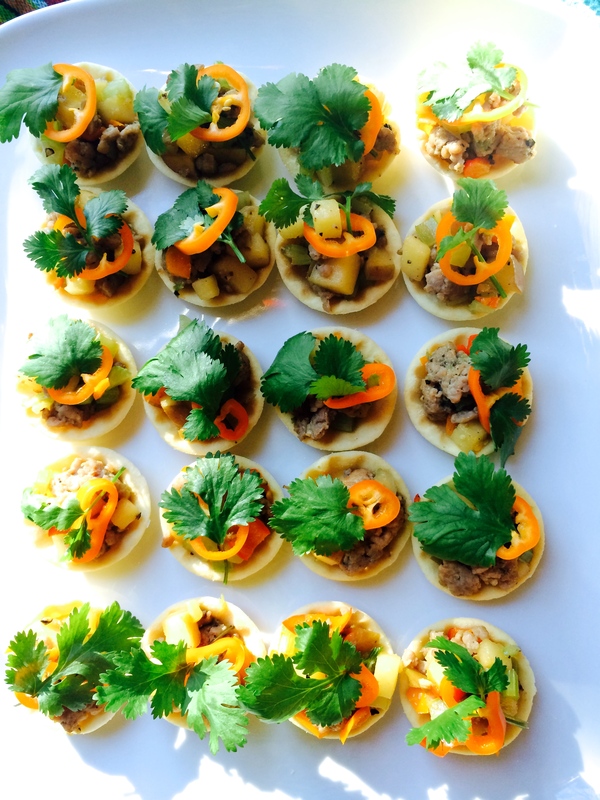 I enjoy cooking with chanterelle mushrooms from the local market and I love to add northwest flavors to my Thai dishes. This year I discovered a sensational new way to achieve both of these ends by adding chanterelle mushrooms to my vegan Thai green curry. The flavor of chanterelle mushrooms reminds me of Hed Kone – a wild mushroom in my village. It has an interesting spicy flavor that goes well with coconut milk or fat. When cooked, the mushroom’s nutty and sweet-fruity flavors combine with its meaty flavor to enrich this meatless green curry dish. This meaty flavor was an added bonus that I didn’t expect but discovered while experimenting last year. I prepared this dish in my series of seven Thai Quick & Easy cooking classes at PCC Cooks. Although I shared the recipe below with more than 14o students, I can still capture the moment when I savored the dish with them during the classes. The chanterelle mushrooms make for a unique combination. This dish is a great reflection of true Thai flavors achieved by using local ingredients such as chanterelle mushroom and Italian eggplant with Thai ingredients such as bamboo shoots, young corn and water chestnuts. 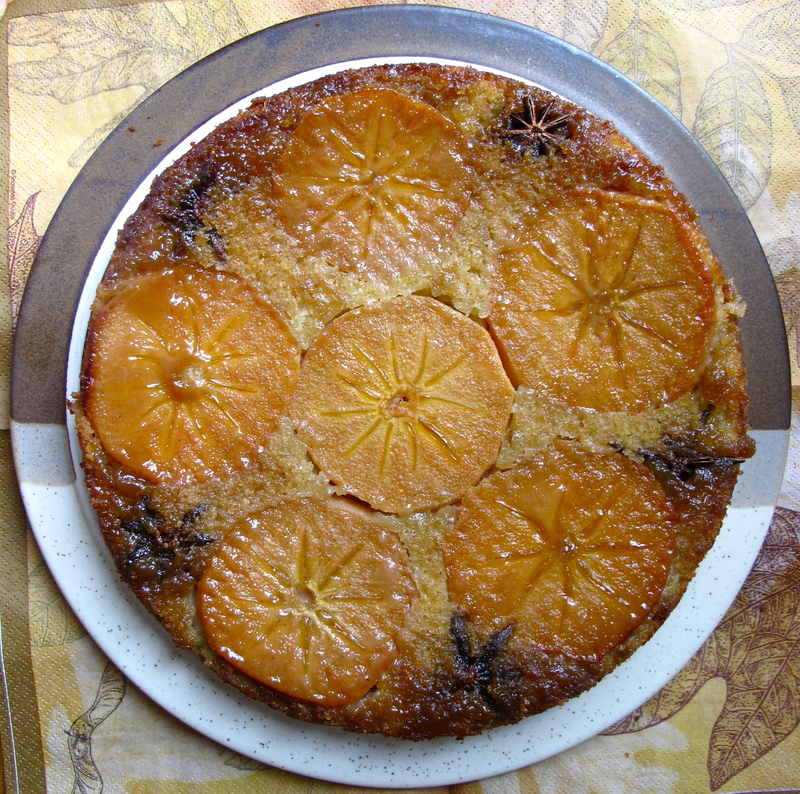 I love this recipe the way it is and would not want to change anything. I want to share this recipe with you so that you can enjoy it as much as I do when fresh chanterelle mushrooms are abundant in the fall. My wishes have been fulfilled and I am content. Green curry is delicious. 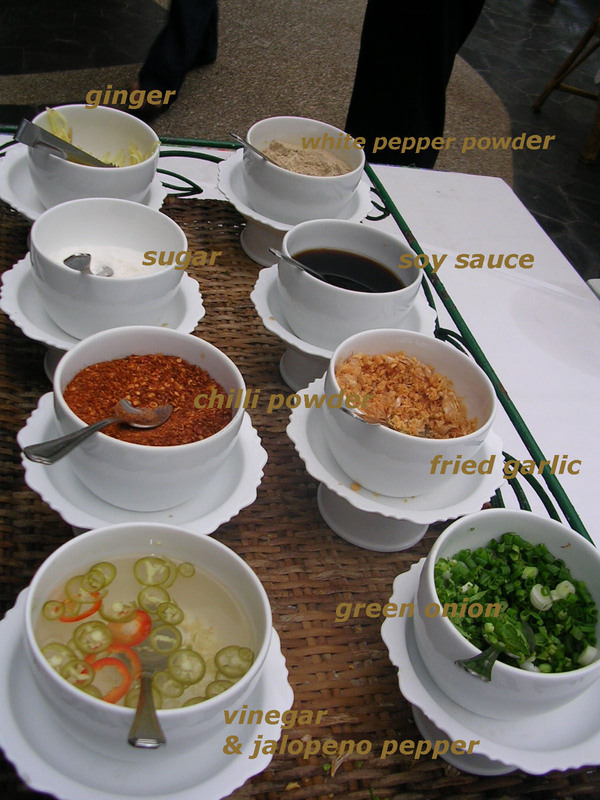 It is distinguished from other curries by its flavor and color which are derived from fresh Thai green chiles. 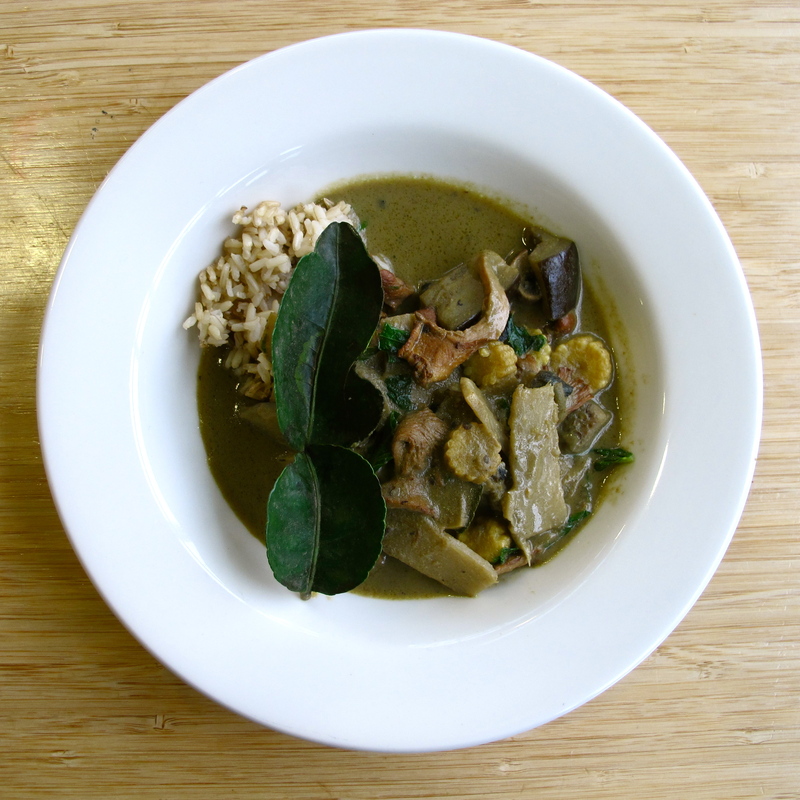 Green curry is as versatile as red curry; it can incorporate many kinds of vegetables and mushrooms. Some vegetables that work well in green curries are zucchini, eggplant, green beans, bamboo shoots, young corn and water chestnuts. Serve with jasmine rice or somen noodles. In a saucepan on medium-high heat, combine canola oil, green curry paste, coriander, cumin powder and green or black peppercorns, stirring constantly until fragrant. Stir in ½ cup coconut milk and let the mixture cook until the oil is separated and curry is fragrant. Stir in chanterelle and portobello mushrooms, baby corn, bamboo shoots, water chestnuts and water; let cook for 2 minutes. Stir in eggplant and the remaining coconut milk, salt, sugar and lime leaves. Let the mixture cook until the eggplant just softens but still holds its shape well. Stir in basil. When it comes to a boil, remove from heat and serve with jasmine rice. Her website is: I Love Thai coPranee Khruasanit Halvorsenoking.com . It has been exactly a week since I returned from Thailand and I am still trying to catch up with our Seattle summer. My friends have all assured me that I didn’t miss much during the past month as we are still having the same cold weather we had in June. This July, Seattle hit the record lowest temperature for summer, so all I really need to catch up on is eating the plentiful seasonal fruits and vegetables from the local farmers markets and nearby towns. During my first grocery shopping back here in Seattle, my cart was full with all sorts of berries. And then my eye caught on a good-looking melon that I haven’t tried: Hami melon. 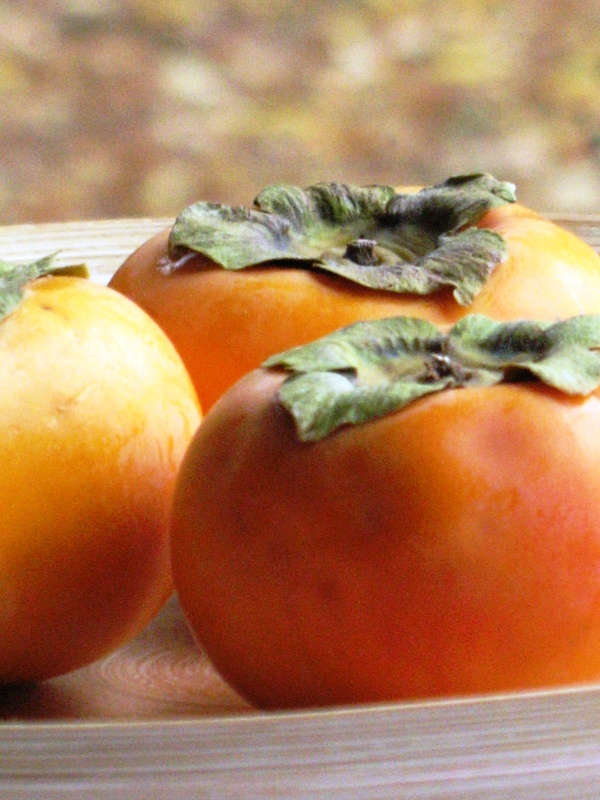 It is grown in California and available from mid-May to July and from September to December. I let it ripen at home for a few days and its sweet aroma was inviting me to taste it. The sweet scent reminds me of the Thai long muskmelon that I used to grow a long time ago in my organic garden in Phuket—it grew abundantly despite my lack of knowledge and farming experience. Hami melon is a type of muskmelon, a Chinese melon variety. A good one can taste sweeter and have a higher sugar content than most other varieties of melon. I decided to make a smoothie with coconut milk to duplicate Taeng Thai Kati, a famous Thai muskmelon dessert made with coconut milk, but we will drink ours instead of eating it. I kept the flavor profile and the amounts of ingredients the same as in Taeng Thai Kati, but added a generous amount of crushed ice and simple syrup to turn it into a nice cold smoothie. I used only one-third cup coconut milk in my recipe, a perfect amount to make a smoothie, a healthy summer drink. But if you are looking for a nice milkshake-like drink and dessert combo, add a scoop or two of coconut ice cream; it would taste heavenly. When a sweet flavor is needed, honey or palm sugar simple syrup are good choices to add a dimension of sweetness and aroma. 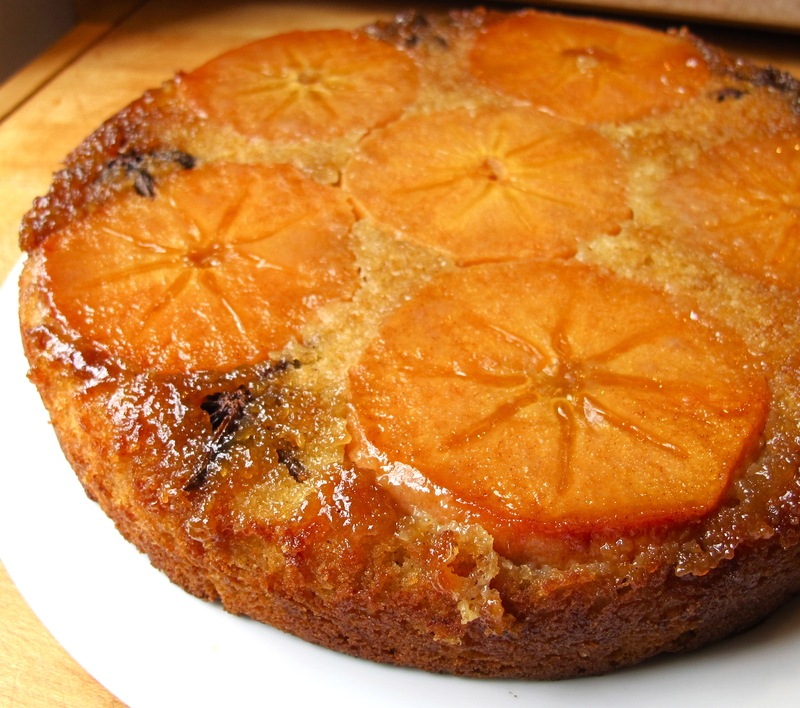 Stock up on a few cans of coconut milk, then anytime the sweet floral scents of melon invite you, all you have to do is prepare this recipe. Hami melon is hard to resist, especially when it is combined with alluring fresh coconut milk. Drink me. Place melon, coconut milk, ice, sugar and salt in the blender and blend until smooth. Pour into a tall glass and serve right away with a straw. A 4-pound Hami melon (medium size), seeded, peeled and diced will yield about 2 pounds of diced melon. 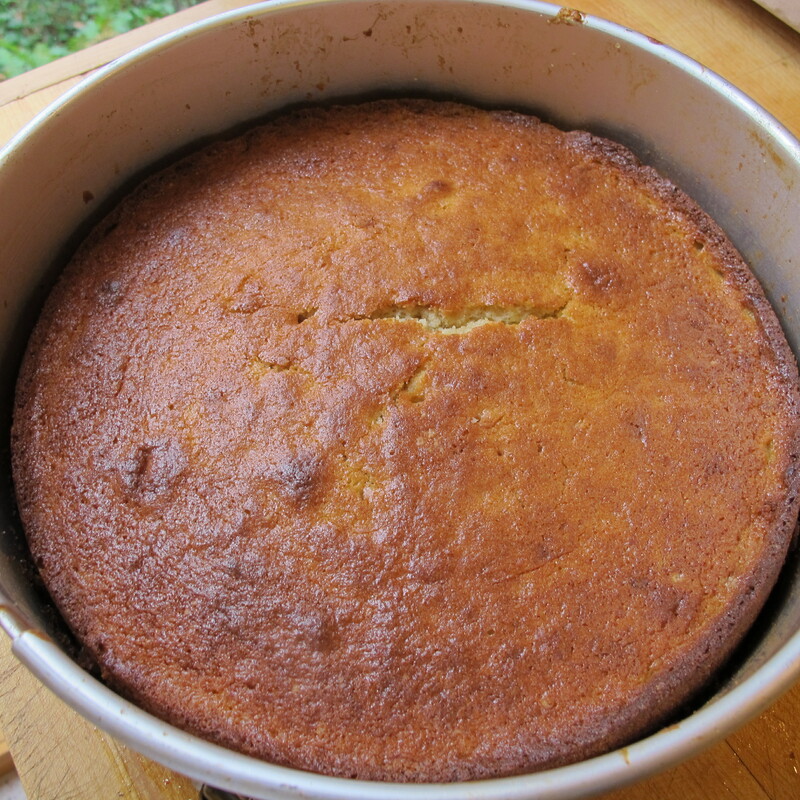 To make palm sugar simple syrup, place a disc of palm sugar (about 4 tablespoons) and about ¼ cup water in a saucepan. Bring to a boil and cook on medium heat for 5 minutes. Cool and chill. Keeps in the refrigerator for up to a week. Yield: ¼ cup.